Nit comb: A fine-toothed comb that helps remove nits and crawling lice from the hair. Insecticide: A chemical that kills insects. Over-the-counter insecticides for lice are also known as pediculocides. 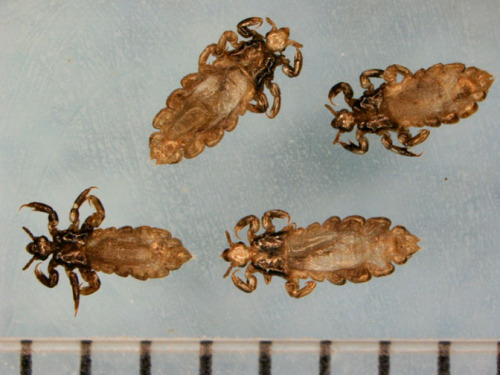 Lice are wingless, crawling insects that live on a host and feed on blood to survive. Lice are very host specific, and sometimes are site specific, so will be on specific part of the host's body. Humans are host to 3 kinds of lice - head lice, body lice, and crab lice, each of which inhabits a different region of the body. What are the stages of the life cycle of head lice? Egg - louse eggs are cemented to the hair shaft by an adult female louse. They are very small in size - some say the size of a knot tied on a string. Nymph - a tiny immature stage of the louse that look like a small adult. How long do head lice stay in each stage? How do head lice spread from one person to another? Lice are most frequently contracted by hair-to-hair contact. They can not jump or fly. Head lice specifically infest human hair. Household pets can not get infested, nor serve as a source of infestation. How can we identify head lice in our hair? Often the first sign of a louse infestation that a parent will notice is intense scratching of the scalp. Scratching is a reaction to louse bites, and to movement of insects in the hair. Intense scratching can be a result of a number of potential conditions, so it is critical to identify nits or crawling lice before proceeding with any treatment. Look for head lice using adequate light and a magnifying glass. Look for the crawling nymphs or adults on the scalp by spreading the hair apart in successive clumps, and examining the hair close to the scalp. The crawling nymphs or adults tend to stay close to the scalp. When they are not feeding, they cling to individual hairs with specially adapted claws. They tend to avoid light, and move surprisingly quickly, so can be difficult to spot. Also look for nits while examining the hair. Nits are attached to the hair close to the scalp. We often see them about one-quarter inch from the base of the hair shaft, often close to the hair line that extends from ear-ear along the neck. Nits are easy to confuse with dandruff and other debris in the hair. They can be distinguished from dandruff or debris because they occur at a regular interval along the hair shaft (so multiple hairs will have an egg attached at ~1/4 inch from the scalp), and are cemented to the hair such that they are difficult to remove. How long do head lice live when not on a human host? Lice need to be in contact with the body of a host in order to survive and grow. They are very temperature sensitive (so need to be close to a warm body) and need to frequently feed on blood. Most head lice will die within 24 hours if they are off of a host. Who can contract head lice? Any person who comes in hair-to-hair contact with a lice-infested individual can contract lice. Head lice are most commonly seen on pre-school and school kids age 3-12. According to the Iowa Department of Public Health, kids can be placed into two risk groups related to lice infestation: 1) kids with head lice, and 2) kids at risk for contracting head lice. Is a head lice infestation a result of poor personal hygiene? It is a common misconception that head lice are a sign of being dirty. HEAD LICE ARE NOT A SIGN OF BEING DIRTY. Most of the children in the U.S. who are or have been infested with head lice are bathed regularly and wear clean clothing. Do we need to take extra cleaning precautions of household carpets, upholstery, toys, etc, once we have identified head lice in the hair of a household member? Treating the hair and scalp of infested individuals is the most important and effective way to control head lice. Treatment is accomplished with an insecticidal shampoo and/or by thoroughly removing nits by combing hair with a fine-toothed comb. Contact your medical provider or pharmacist or see the references listed below for specific product information. Supplemental measures to control lice are generally not effective for two reasons 1) it is extremely unlikely that lice will survive off of a host for more than a day, and 2) it is exceedingly rare to find live lice on the bed linens - even of people who have extreme infestations with many lice. Therefore, it is unlikely that live lice will be on carpeting, upholstery, toys, etc. If you would like to use supplemental cleaning precautions, consider the lifespan of lice off a host, and clean just those items that have been worn or used by an infested person in the two days prior to when the infested person was treated. Wash and dry clothes with hot water and air, or bag and seal items in a plastic bag for 2 weeks - in the highly unlikely event that a nit is on the bagged item, a 2 week period will exceed the amount of time it takes an egg to hatch and the lifespan of a nymph. If you have identified lice on a household member check the hair of all other household members regularly and avoid hair-to-hair contact with the individual who has the infestation. Can head lice infestation reoccur even when we have properly treated for the presence of head lice? Yes. Treatment for head lice does not prevent another infestation. Shampoos that we use for Control contain an insecticide that will kill nymphs and adults, but the effect is short-lived, and the insecticidal shampoo will not act as a repellant against future infestations. Lice infestation can reoccur if a person has hair-to-hair contact with another infested person. Remember that lice are most commonly spread by direct hair-to-hair contact. To prevent re-infestation check school-aged children regularly for lice. The Iowa Department of Public Health recommends that parents spend 15 minutes per child, each week, checking for crawling lice or nits. If a school-aged child is infested, check all members of the household for lice. Avoid hair-to-hair contact with an infested household member. What is the new news about superbug head lice? There have been some recent headlines on â€˜super liceâ€™. This refers to a problem we currently are facing that lice appear to be developing resistance to over-the-counter, lice-killing shampoos. In this way, lice are like bacteria that are increasingly resistant to antibiotics. Human head lice do not transmit any diseases. They are tedious to treat, and distressing for parents and children, but they do not pose any risk in terms of transferring bacteria or viruses to the host. Where can I get more information on head lice? Links to this article are strongly encouraged, and this article may be republished without further permission if published as written and if credit is given to the author, Horticulture and Home Pest News, and Iowa State University Extension and Outreach. If this article is to be used in any other manner, permission from the author is required. This article was originally published on September 24, 2008. The information contained within may not be the most current and accurate depending on when it is accessed.